The Audioengine P4 is a class of its own and one of the best high-fidelity speakers you can find from a pure sound performance angle. It is essentially a 2-way passive, high performance bookshelf speaker pair with great looks and sound quality but without the need for external amplifiers. These speakers come with gold-plated 5-way binding posts, silk dome tweeters with Kevlar woofers which are magnetically-shielded, as well as a frequency response of 58Hz-22kHz. They are compact, durable and aesthetically one of the best bookshelf speakers we have come across, making them ideal for your living room, bedroom or office or as a surround speaker for your home theatre system. The P4s come in three options: black, white and solid bamboo. While the Audioengine P4s comes with an arguably higher price tag, they are definitely some of the best high-fidelity speakers that are worth investing in if you want to upgrade your stereo sound system. To be clear, the P4s are spectacular speakers that specialise in detail, forward-type sound and bring all the music detail without being loud. We reviewed this speaker while listening to classical pieces and the notes came out smooth and superb, which clear details present at every level. The P4 provides a crisp, forward, detailed sound without the need for excessive volume, and these drivers deliver the quality of sound that we were looking for – we were blown away by the clarity and resolution of these best bookshelf speakers. The P4s have hands down some of the best soundstage from bookshelf speakers and the level of separation of detail and instruments were incredible. The P4 is essentially a system that improves with age. The sounds are very subtle and you could almost feel as though you were listening to a much larger bookcase speaker/powered amplifier system. The P4s also work very well when combined with Audioengine’s S8 subwoofer which adds a little more depth to the bass output. Audioengine even has a dedicated engineer who would be able provide assistance by taking questions and helping with technical issues with your Audioengine equipment, which makes things much more convenient. The P4s can also connect to tube amplifiers to enhance the sound output – the P4s can handle perfectly loud music without distorting, while allowing all the music properties to remain the same. The P4s are very full sounding speakers and have a small footprint but the sound presence produced by these speakers is truly something to behold. In short, the P4s are so much more listenable and easier to setup than a 5.1 system and yet the sound stage they create is so lifelike that it feels as though you are in a 5.1 setup. We have great experiences reviewing the P4s while watching blu-ray movies and simply listening to music on these speakers – and we are happy to conclude that the P4s are well and truly some of the clearest and best sounding bookshelf speakers you can find. If you listen to vinyl records, the P4s will bring out the details in your music with crystal clarity. The Verdict? The P4s are among the best high-fidelity speakers that excel in terms of producing forward-type detail and crystal clear sound that are best suited for those who enjoy listening to every detail in their music. The P4s produce phenomenal clarity, resolution and musical detail without being loud. Despite their small size, they put out so much sound and power especially with vinyl soundtracks. That said, the P4s alone may require an additional subwoofer to connect to it (such as the Audioengine S8) to enhance the bass response if you enjoy bass heavy soundtracks. Other than that, we couldn’t be more pleased with these speakers and for the price they are hands down one of the best bookshelf speakers you can get. These best high-fidelity speakers well exceeded our expectations and we highly recommend them. The LS50 are some of the best high-fidelity speakers designed for high-end audio performance with incredible detail. They are an active system that cover a lot of the frequency spectrum and delivers a very clear and tight sound. They are equipped with a KEF signature UNI-Q Driver array that can produce sounds as low as 40 Hz for a powerful and deep bass. It connects wirelessly to any streaming device using both Wi-Fi and Bluetooth, giving users the flexibility between the two systems. By using Wi-Fi as a transmission medium, users can also take advantage of a dedicated mobile app that offers control over the speaker system and high quality music transmission. The application is widely available on large app stores such as iTunes and Google Play. In case wireless is not preferred, the speakers are equipped with several wires connections, such as an asynchronous USB connection, a digital optical input, and also an RCA analogue input. The stereo output from the LS50 speakers is immensely satisfying and crystal clear – with great attention to detail and zero harmonic distortion across all frequency ranges. If you are looking for the best high-fidelity speakers that can deliver high-end audio, the LS50s are your best bet. The LS50 is designed for audiophiles and has numerous distinguishable characteristics. We found that the transmission options are well-implemented and provide high definition audio with no quality loss or signal degradation for movies or music. There is no latency or lip-sync issues with the wireless connection, so there are no problems regarding synchronisation between audio and video arise. The LS50W has a time correcting digital signal processing technique implemented to adjust any crossover delays between the tweeter and the woofer. While most speakers need to be listened to from a ‘sweet spot’, the LS50W delivers high quality audio all throughout, without any phasing issues between the two sound sources. This feature can be turned off by the user at any time in case a traditional listening experience is desired. The sound system supports resolutions as high as 192kHz sampling rate, which is way above CD quality level and ensures there is no aliasing or filtering within the file. This sampling rate is important when editing audio, so this system can be used by professionals for any kind of detailed work. The 24-bit depth resolutions allows for a wide dynamic range that creates an even more enjoyable listening experience, as the quiet sections have no noticeable noise floor and the loud sections do not clip or distort. The LS50W is able to connect wirelessly via dual-band Wi-Fi connectivity or Bluetooth 4.0, as well as through USB connection, digital TOSLINK inputs or RCA analog inputs depending on your preferences. It delivers very high quality audio through various mediums and is relatively easy to setup. The LS50W features a high resolution of 192 kHz and 24-bit depth resolution throughout the digital signal path, including through the wireless transmission mediums, both Bluetooth and Wi-Fi. This high of quality does not make an audible difference to, for example CD quality, which is 44.1 kHz and 16-bit depth, but it is necessary in the professional environment for audio processing and editing. The speakers feature 4 digital to analogue converters, two for each channels, being split into a converter for the tweeter and one for the woofer. The LS50W also features a streaming preamplifier for an adequate level across the signal chain. The Uni-Q is a technology featured in this product that uses digital signal processing techniques to correct the time difference at the crossover between the two drivers of the speaker. Usually, time differences result in phase cancellations between the two sources and create a thinner sound. This technique removes those impediments and creates a consistent and full experience. The Verdict? The LS50Ws wireless system are among the very best high-fidelity speakers that offer professional audio workers the convenience usually marketed towards casual consumers. These speakers can be connected to any kind of existing system, using both wired and wireless connection, analogue and digital. The LS50W provides high quality sound and renders any kind of audio true to the original source. They are suitable to be used in professional environments for mixing and editing. In addition, they can have an additional subwoofer connected, creating a true 2.1 system when necessary. We particularly liked the fact that the LS50Ws uses a 5.25” Uni-Q driver capable of reaching down to 40 Hz, combined with a built-in 192kHz/24bit DAC and 230W amplifier. Overall, the LS50Ws are the best high-fidelity speakers that provide high-end HD sound performance and are a great choice for audiophiles who want a sublime music experience. The Marshall Kilburn is one of the best high-fidelity speakers in the Marshall line of speakers, and can pump out an incredible 20 hours of continuous playtime on a single charge. It comes with two ¾” dome tweeters and one 4” woofer for enhanced stereo sound performance, with a clear midrange and extended highs for both articulated and well balanced sound. The Kilburn features a classic Marshall design with a vintage looking front and gold-colored metal details. You can easily connect to the Kilburn speaker using your smartphone, tablet or laptop to wirelessly stream music to the speaker. The built-in rechargeable battery is capable of delivering a solid 20 hours of playtime on a single charge, which clearly makes it as one of the most portable best wireless speakers you can get in terms of longest battery life. The Kilburn speaker weighs slightly under 7 pounds which makes it lightweight enough for easy transportation; it also comes with a nice leather strap for you to take it around on the go. If you are looking for the best high-fidelity speakers with very good sound and long lasting battery life, the Marshall Kilburn is an exceptional choice. The Verdict? We were extremely impressed with the Marshall Kilburn and felt that every single detail about this speaker was carefully thought out by the manufacturers – from the carefully crafted vintage design to the elegant knobs on the top of the speaker and brilliant sound performance, we were simply blown away by the attention to detail and the classy vintage design. It is well and truly one of the best high-fidelity speakers you can find in the Marshall line of speakers. The sound performance on the Marshall Kilburn was very good, with crisp highs, detailed midrange and very good low end frequency reproduction. We also liked the option of being able to adjust the volume, bass and treble through the knobs on the top of the speaker and the knobs looked very stylish and pretty amazing. The speaker also comes with a nice leather strap which you can use to transport the speaker around conveniently. Overall, the Marshall Kilburn is definitely one of the best high-fidelity speakers you can find with a vintage and classy design and superb sound performance and comes highly recommended. The Sonos Play 5 is one of the best high-fidelity speakers that deliver richer, deep sound with more powerful bass than its predecessors in the Sonos Play series. The Play 5 is able to deliver rich and clean sound with deep bass, and comes equipped with three Class-D amplifiers and three custom built drivers which create a full and wide soundstage which brings out the details in vocals and instruments. It is also equipped with a rear-firing bass radiator which pumps out exceptionally deep lows for a speaker of this size, and sounds great in virtually any position due to the Trueplay speaker tuning which optimizes sound performance in your preferred orientation. You can also wirelessly pair the Play 5 with other compatible SONOS speakers into separate left and right channels for a bigger and deeper stereo sound. The Play 5 will pair wireless to your home Wi-Fi or mobile device through an app, and can stream music from Pandora and Spotify without any issues. If you are looking for one of the best high-fidelity speakers that can deliver really solid sound performance for home audio, the Sonos Play 5 comes highly recommended. The Verdict? While the Sonos Play 5 does require a wireless access point and an app to stream music, it is one of best high-fidelity speakers in terms of sound performance and does an extremely good job of tuning itself to the surrounding environment to optimize the sound quality. The highs and mids on the Play 5 are exceptionally crisp, clear and detailed, and we were very impressed with the bass response which felt impactful, deep and powerful. The sound from the speaker has a certain presence and authority that makes it feel very enjoyable to listen to. The design of the Sonos Play 5 is clean and minimalist, and is inconspicuous enough to blend in easily into the room. The Play 5 can also fill a large room with powerful sound without any distortion, and is suitable as rear speakers for your home theatre system. If you are looking for one of the best high-fidelity speakers with extremely good sound quality and deep bass, the Sonos Play 5 is the speaker you should get. The Marshall Stanmore is one of the best high-fidelity speakers with a stunning vintage design and really great sound. It is essentially a portable Bluetooth speaker that can pump out a tremendous 80W output and is ideal for large rooms or gatherings. 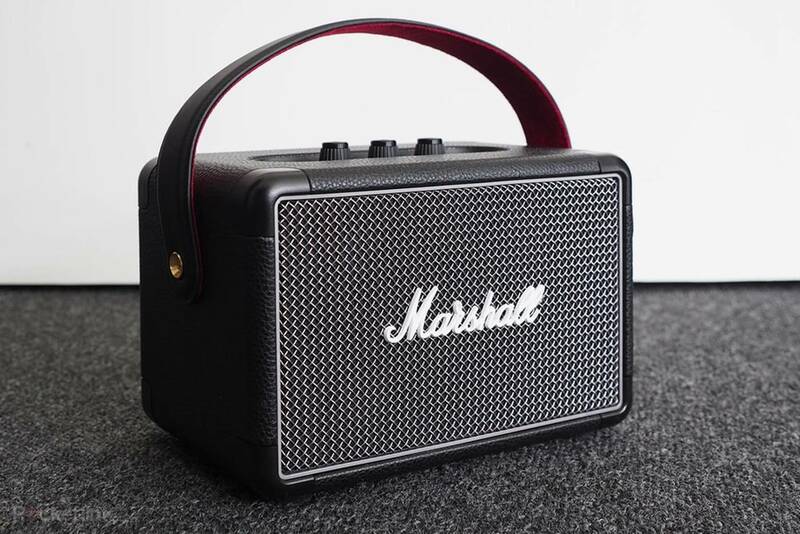 The speaker features classic Marshall design details with analogue knobs and a vintage leatherette cover that makes it look aesthetically appealing. You can connect your smartphone device to this speaker with Bluetooth with aptX wireless streaming for high quality music transmission; it also comes with RCA inputs to plug into the record player or use the 3.5mm auxiliary input for non-wireless music sources. We liked the fact that it comes with a coiled, double-ended stereo cable with two 3.5mm plugs that looks really classy. The Stanmore speaker also features two power modes – power-saver and standard modes – to optimize the speaker’s power performance to save battery. Overall, it’s a really classy and one of the best high-fidelity speakers that you can have with a classic Marshall vintage design. The sound performance from the Marshall Stanmore is solid and punchy – it has enough power and wattage to fill up a large room with filling sound without any issues. The speaker produces really accurate and pristine sound quality with crisp highs and smooth lows – the lower-midrange frequencies sound very pronounced with plenty of depth. The bass on the Stanmore hits hard and punches deep, although we felt that it does not have the level of depth that the Sonos Play 5 can reproduce. The volume that the Marshall Stanmore can pump out is impressive – you can turn up the volume to its maximum setting and expect very little to no distortion. The speaker does not produce any buzzing noise when connected via Bluetooth and the treble ranges sound smooth without any harshness. We also tested the sound quality on the Stanmore while plugged in using the RCA cables and they sound fantastic – with smooth sound quality and clear vocal performances. You also get a good degree of stereo separation and soundstage with the Stanmore speaker which is perfect if you like instrumental or classical music genres. 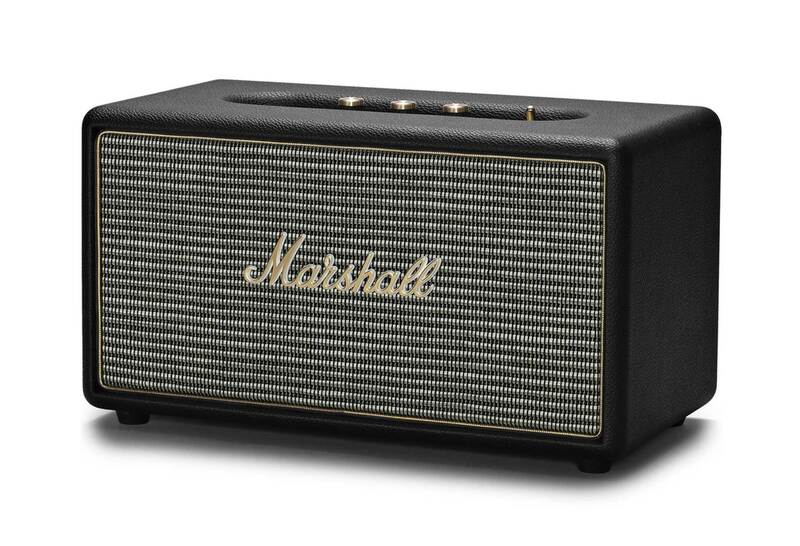 If you are looking for a home Bluetooth speaker with clarity and plenty of volume, the Marshall Stanmore is a great choice. The Marshall Stanmore really excels in terms of its unique vintage design. It’s the perfect speaker for those who like a vintage rock n roll feel to the speaker with analogue buttons. The volume and bass knobs look really sleek and feel very nice to touch – it comes with treble and bass knobs which allow you to adjust the sound performance according to your preferences and looks really delightful to touch. The speaker is really easy to hook up and the wireless Bluetooth connectivity works like a charm. The speaker comes with RCA inputs and 3.5mm inputs with a double-ended cable for you to plug it into turntables or to your laptop if necessary. The speaker looks really classy and blends in nicely with modern home interior décor – you can place it in the living room or use it as a bookshelf speaker. The speaker is relatively large but also built for portability – it has a solid construction and made of durable materials and feels very nice to touch. The wireless Bluetooth on the Stanmore supports aptX connectivity which provides high quality music streaming from compatible aptX Bluetooth devices. We also liked the fact that the Stanmore speaker is compatible with Apple TV and other devices that have an optical output, which makes it pretty versatile. The Verdict? The Marshall Stanmore is one of the best high-fidelity speakers with a classy vintage design and quality sound performance. 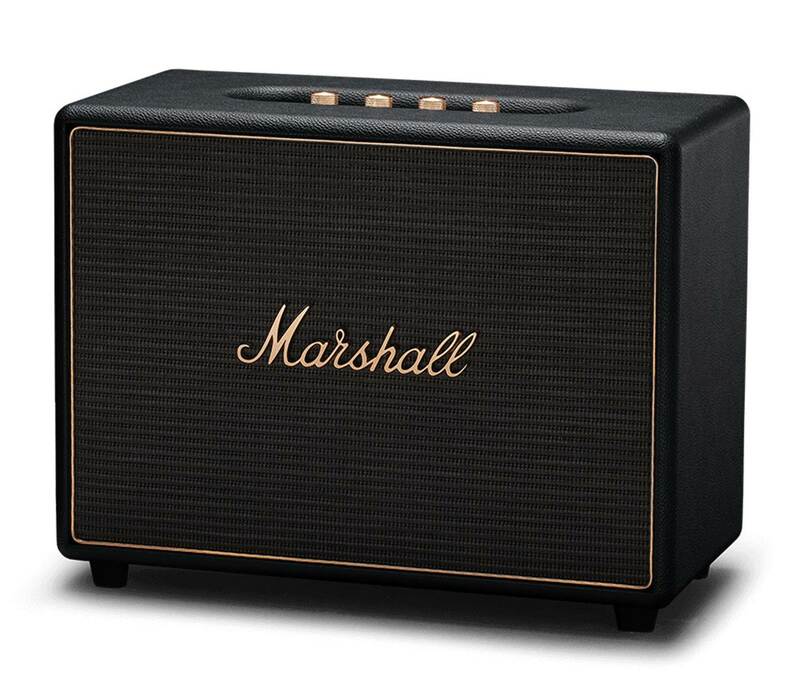 The speaker features a vintage Marshall design with leatherette casing and classic knobs that feel nice to touch. The speaker is made from really durable materials and has a pretty solid weighty feel to it – which indicates that it is made of quality materials. The sound performance from the Marshall Stanmore is superb, with crystal clear vocal reproduction, crisp treble ranges, detailed lower-midrange frequencies and good bass output. We were very impressed with how clean the Marshall Stanmore sounded straight out of the box with no hint of any distortion at high volume levels. You can practically crank up this speaker to maximum volume and it will not produce any distortion; the sound quality remains consistent throughout with plenty of depth and soundstage with up to 80 watts of pure power. The wireless Bluetooth connectivity on the Stanmore works like a charm and even supports aptX connections. It also comes with RCA inputs to plug into record players, optical inputs and 3.5mm inputs for non-wireless music sources. If you are looking for one of the best high-fidelity speakers with a classic vintage design, the Marshall Stanmore is the speaker for you. 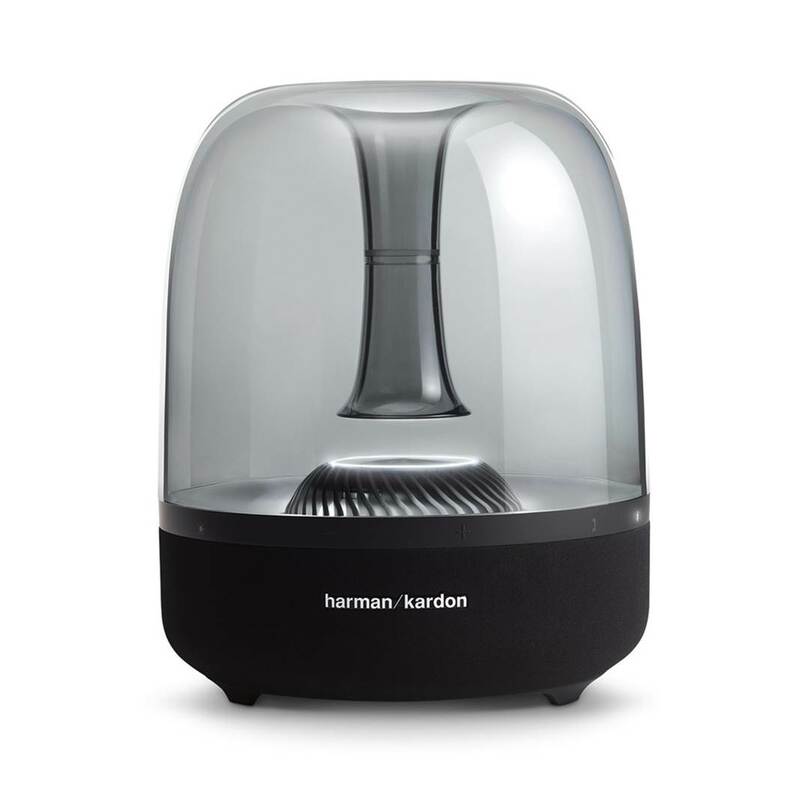 The Harman Kardon Aura Studio 2 is one of the best high-fidelity speakers that can produce a stunning amount of low-end bass with crisp sound quality. It is built to deliver 360 omni-direction sound and comes with ambient lighting which provides an aesthetically appealing white light glow from the center turbine with an animated ring of center LEDs. The Studio 2 features proprietary stereo-widening DSP technology which helps to deliver fully optimized audio performance. The speaker itself comes equipped with six high-midrange transducers and a dedicated subwoofer that delivers deep stunning lows and tight bass performance. It also comes with wireless dual sound feature that allows you to link two Aura Studio 2 speakers together to create a much wider sound-field. If you are looking for one of the best high-fidelity speakers that can produce stunning low-end bass and crystal clear music performance, the Aura Studio 2 comes highly recommended. The Verdict? The Harman Kardon Aura 2 is one of the best high-fidelity speakers that deliver stunning lows and very deep bass performance. The sound quality from the Aura 2 is very crisp, with nice midranges and very tight lows that add plenty of depth and complexity to the sound. If you are in the market for a bass-heavy Bluetooth speaker, the Aura 2 will definitely not disappoint. Bass-heavy music genres such as electronic dance music hits hard and come with very tight and bass – the bass does not muddy into the midrange frequencies and stays where it should be as bass. It hits tight and goes really low – you can even feel the bass while listening to the Aura 2 speaker at 70% volume. We also liked the fact that the speaker does not distort at high volume levels, although the higher frequency treble ranges does start to roll off at higher volumes. The speaker has a really sleek and stylish design with ambient lighting that gives it a very unique appearance. It blends in nicely with modern home interior décor and makes for a great conversation piece in the living room or dining room. Overall, it’s one of the best high-fidelity speakers you can find that delivers the strongest bass and if you are a bass lover, we highly recommend this speaker for your home. The Edifier R1850DB is essentially a dynamic 2.0 high-fidelity Bluetooth speaker housed within an MDF frame that delivers stellar stereo sound quality. The speaker comes with high-quality acoustic drivers and woofers that deliver full-range sound with deep bass – it also features an additional subwoofer output which allows you to add a dedicated subwoofer to these speakers to transform it into a full 2.1 sound system. The Edifier R1850DB comes with Bluetooth 4.0 for wireless music streaming and is compatible with virtually any Bluetooth smartphone device including phones, tablets or laptops. It also has a digital and analog input for PC, turntables and non-wireless music sources. We also liked the fact that these home speakers have optical and coaxial ports for lossless connection. The speaker comes with treble and bass controls with volume toggle buttons on the rear panel. It also comes with a wireless remote control for input selection and volume adjustment on the fly. 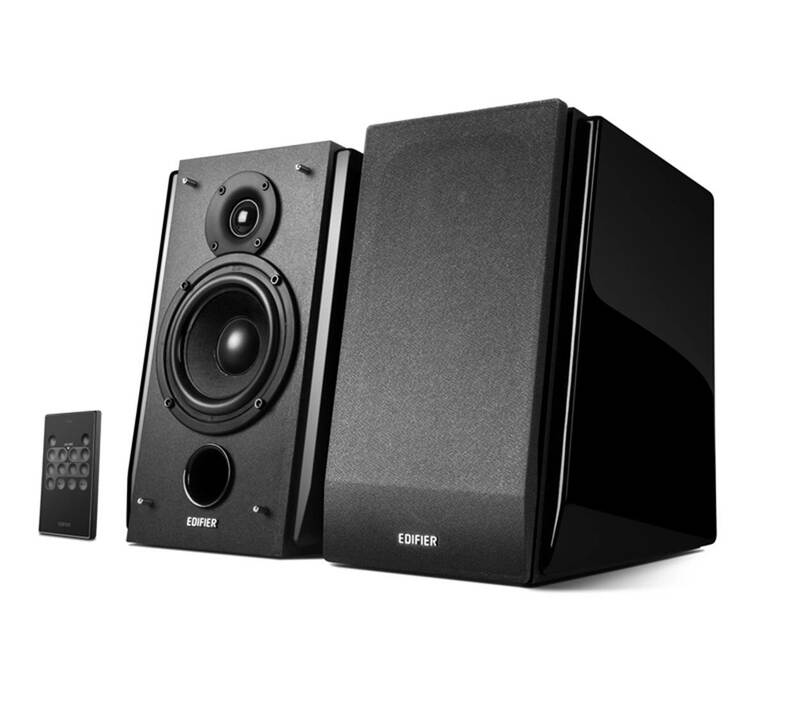 If you are looking for some of the best high-fidelity speakers, the Edifier R1850DB speakers are the ones to go for. The sound performance of the Edifier R1850DB is silky smooth and crystal clear. The silk dome tweeters and woofers produce very clean sound performance with deep bass. We paired the Edifier R1850DB speakers to an 8” Polk subwoofer for much deeper bass and lower-end frequency response. 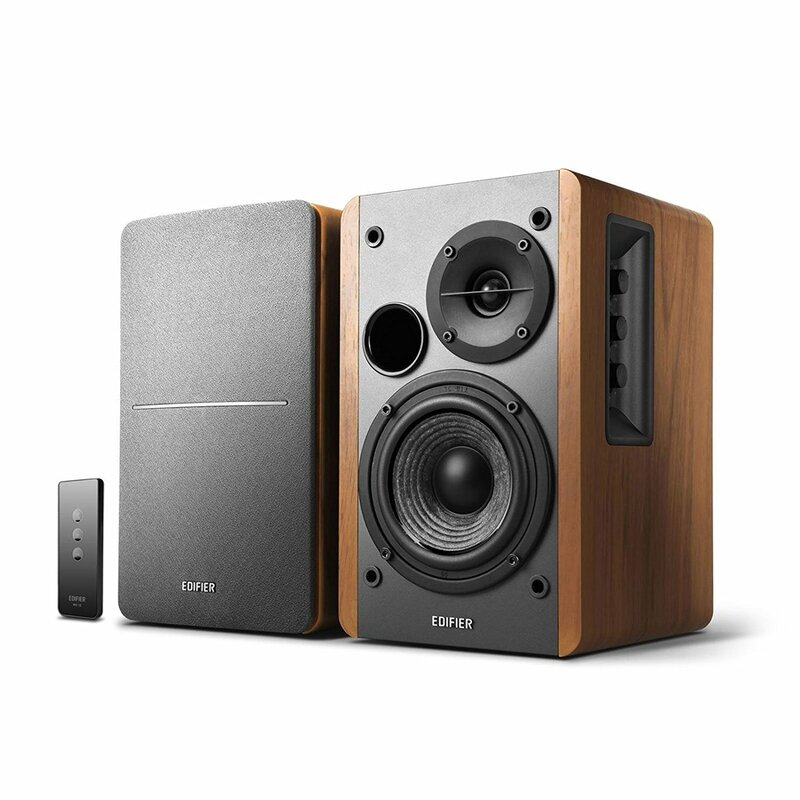 The Edifier speakers produce crisp highs, detailed midranges and smooth vocals. The level of stereo separation that you get with these 2.0 speakers is exceptional and you can hear each detail coming from separate channels with pristine clarity. They also produce full-range sound quality and can reproduce practically the entire audio spectrum without any issues. We did not experience any boomy sound or harshness in the treble ranges with the R1850D speakers – every note was accurately reproduced and undistorted. The Edifier speakers can also pump out very good volume and fill up a large room with filling sound without any distortion. Orchestra performances on the Edifier speakers sounded very realistic and cohesive; you can pick up details in the music which you might not have noticed before. 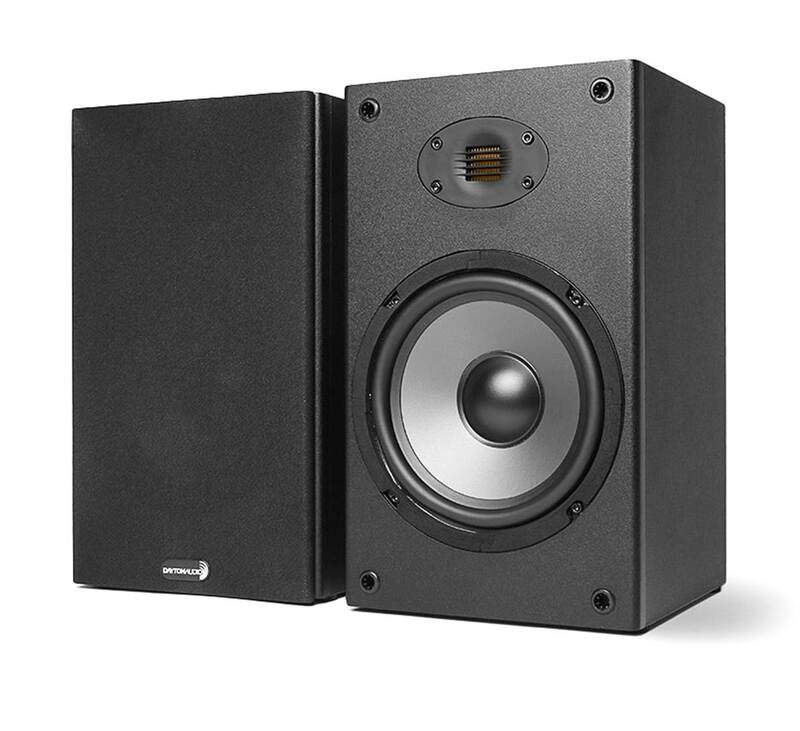 The level of bass impact from the Edifier speakers is also excellent, with plenty of depth and deep lows that add a layer of complexity and substance to the music. The Edifier R1850DB speakers have a really sleek and modern looking design that blends in nicely with modern home interior décor. We liked the fact that these home speakers come with removable grills and gives you the option to take them off or keep them on depending on your preferences. The volume, treble and bass controls are located at the back of the speaker which keeps the front appearance clean, although the buttons are a little hard to reach. The speaker comes with an included remote control which makes adjusting the sound and volume relatively convenient. The entire speaker is housed within a solid MDF frame which reduces sonic resonances. We tested the wireless Bluetooth connection and it works like a charm without any interruptions or dips in sound quality. It is also easy to connect non-wireless music sources such as your laptop or computer to these speakers through the RCA to AUX input, or via the optical or coaxial inputs for turntables. The subwoofer output on the R1850DB makes it convenient to connect an additional subwoofer to create a full 2.1 setup for deeper bass – although we feel that the low-end frequencies on the R1850DB are well articulated even without a dedicated sub. The Verdict? The Edifier R1850DBs are some of the best high-fidelity speakers that deliver crystal clear stereo sound in a full 2.0 setup. These speakers are sleek, modern and very solidly constructed with MDF cabinets. The sound quality from these speakers is among the very best we have tested, with crystal clear vocals, crisp highs, nice treble ranges and deep bass. The level of detail and stereo separation that you get with these speakers is outstanding – you can even crank up the volume on these speakers and they will not produce any distortion. The sound on these speakers is full-range and they can cover virtually the entire frequency spectrum very well. The R1850DB speakers have treble and bass controls at the rear with a wireless remote for easy adjustment. The Bluetooth connectivity on this speaker works like a charm with no dips in sound quality. It also has optical, auxiliary and coaxial inputs for a variety of non-wireless music sources. Overall, the Edifier R1850DBs are some of the best high-fidelity speakers we have tested and we highly recommend them. The SONOS Play are among the best high-fidelity speakers that sync wirelessly and is a great standalone audio setup or extension to current home theater systems. It is very small in size, yet it does not compromise on quality, volume or frequency content. The speakers deliver high fidelity audio which is great for any kind of media whether it’s blasting music or watching movies. It connects to your home system through Wi-Fi, having the capability of expanding an existing audio system. Because of the wireless connectivity, it can also stream music from the most used platforms such as Apple Music, Spotify, Pandora and Prime Music. 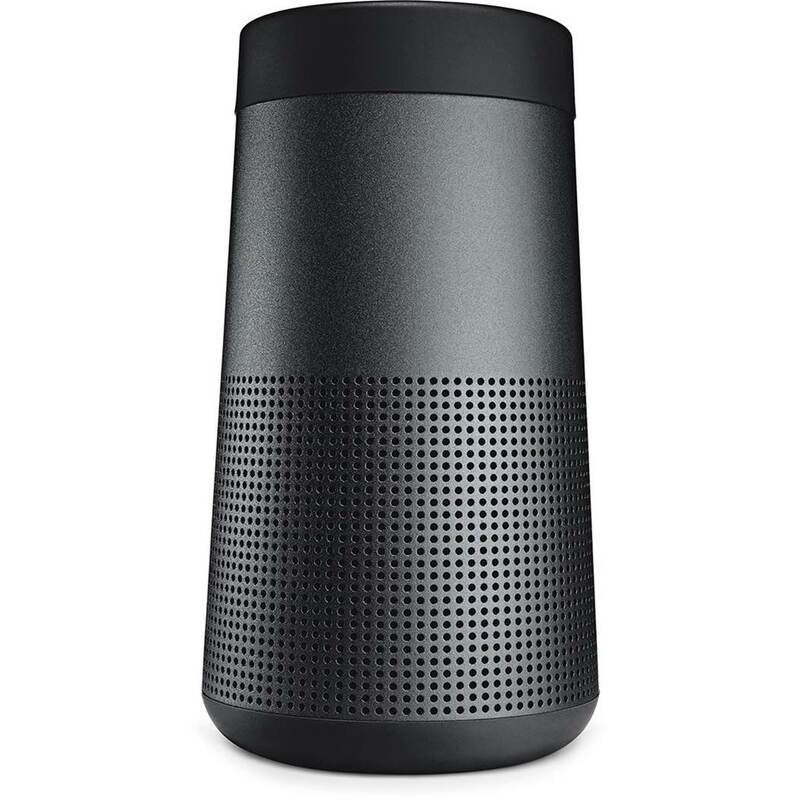 The SONOS Play can be used in conjuncture with Alexa for voice enabled commands, starting, stopping and changing songs only by using natural language. Besides the voice control enabled by Alexa, it can also be configured using the Sonos app, giving users control over volume and which speakers play back the sound. The speakers can be placed anywhere because of their small size and they are also mountable on walls for spaces with limited surfaces. If you are looking for one of the best high-fidelity speakers that can fit into a home theater setup or function as wireless standalone speakers, the SONOS Play is a great choice. 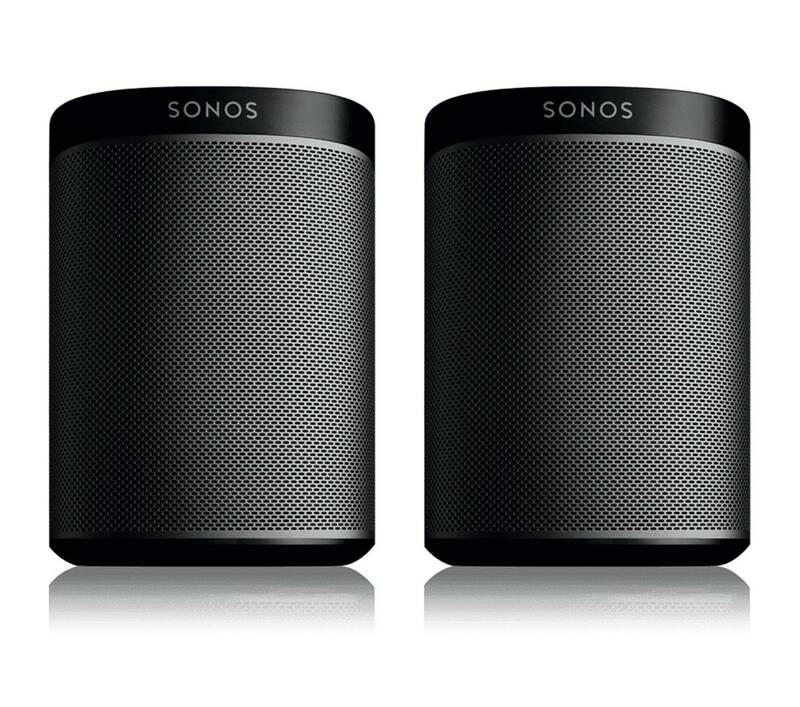 The SONOS Play speakers deliver high quality surround sound which sounds exceptionally crisp with deep bass performance. They connect wirelessly to the streaming devices and have a reliable connection. There are no transmission issues or audio quality degradation. In case of an audio-visual media, there is no transmission latency so no synchronisation problems arise between audio and video. Even though the speakers are small, they project loudly in any room and have good frequency content, from sharp tops to punchy bass. Movie performances sounded very crisp with no lip-sync issues or noticeable lag. These speakers use class-D amplifiers and custom-built drivers that are fine tuned to the design of the speaker unit. In addition, the Trueplay Speaker Tuning is a technology developed by SONOS which applies an equalization filter for the speakers following an impulse response analysis of the room. The speakers play a sweeping sine wave, listen to the room, analyse the frequency response, and apply an equalizer that filters out resonant frequencies. This ensures a clearer sound and removes any muddiness in the sound signature. The design of the stereo Sonos Play is sleek and modern, with small units that pack a lot of power. Their wireless design allows the user to place them anywhere in their home as long as there is a power supply or socket nearby. 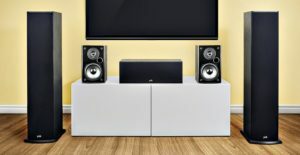 These can either be used as a stereo setup for a television or computer, or simply remotely in strategic places in the house for general listening. They are also humidity resistant, which opens up even more placements for the speakers, including kitchens, bathrooms, balconies and so on. They perform equally as well and can offer your home a full audio setup, not limiting the sound experience to the living room, bedroom or entertainment room. The speakers can be mounted on the wall which means that even in small spaces, or rooms where surface space is limited, they can be easily implemented and perform just as well. The Sonos app allows users to quickly search through all the music services available and adjust playback individually to each room or speakers. It connects through Wi-Fi, so as long as the connection is established, distance is not an issue. The Sonos Play is compatible with Alexa, so the whole system can be converted into a smart system that responds to voice commands. The Verdict? The SONOS Play is one of the best high-fidelity speakers that provide exceptional sound quality and rich powerful sound effects. It can be used both as a stand-alone system for television, computers or general room placements, as well as expanding existing systems, with the condition that everything connects through the same Wi-Fi network. The Sonos Play provides high quality audio and can be adapted to any room using the Trueplay Speaker Tuning and play to the advantages of the space that it’s located in. It provides crystal clear dialogues and deeper bass performance for movies and music. It can be placed in any part of the house as it is humidity resistant, including places like bathrooms, kitchens and balconies. We liked the fact that the SONOS Play speakers are easy to set-up with home Wi-Fi and you can even use them to create a multi-room wireless listening experience. On the whole, the SONOS Play is one of the best high-fidelity speakers that provides superb soundstage and crisp sound performance and comes highly recommended for wireless surround sound setups. 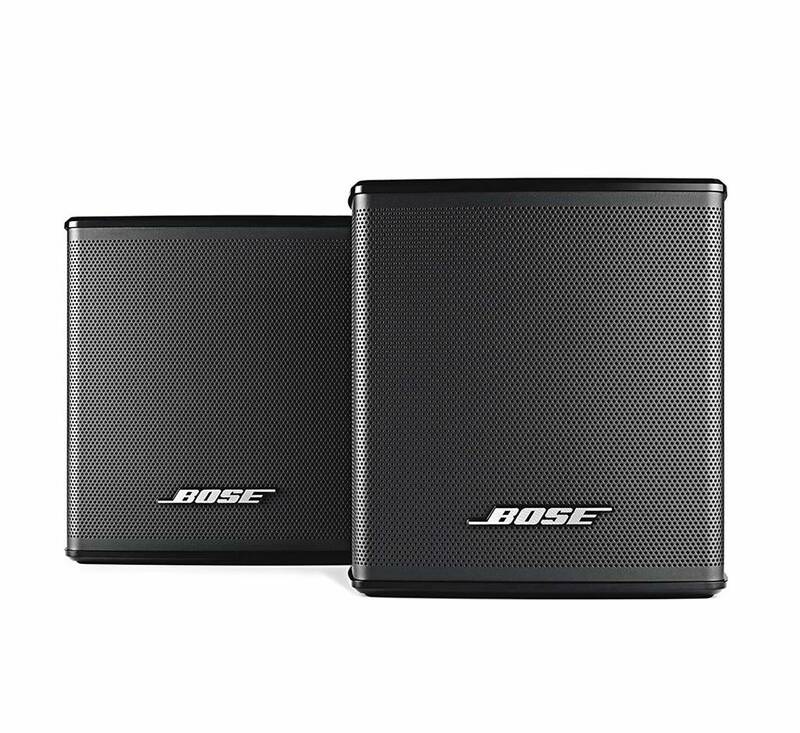 The Bose Virtually Invisible 300 are some of the best high-fidelity speakers designed to provide crystal clear HD sound quality while blending into modern home decor. As their name suggests, they are very small and yet deliver on high quality audio. They are designed to be inconspicuous, convenient and easy to place in any location without disrupting the environment. The Bose Virtually Invisible 300 speakers are designed to pair with the Bose SoundTouch 300 Soundbar and the Acoustic 300 bass module to create a more complex, surround sound system. They also have wireless connectivity which enables them to seamlessly connect to the SoundTouch 300 Soundbar main unit, removing any inconveniences caused by audio cables and additional wiring. Their small size allows them to be placed anywhere in the room in order to create a truly immersive surround sound experience, without compromising on quality or power. These speakers make the user feel as though they are sitting at the centre of the action, whether they are listening to music, watching films or playing video games. If you are looking for the best high-fidelity speakers for your home theater setup, the Bose 300 speakers is definitely a great choice. The Bose Virtually Invisible 300 delivers great sounding audio while being extremely convenient and easy to use. Even though they are only add-ons that complement the main Bose SoundTouch 300 Soundbar, their freedom of positioning is a great advantage and allows users to create custom setups that produce a true sense of envelopment. As they are both small and wireless, they can be placed in any kind of room and in any kind of space. Whether they are above and shooting downwards, down and shooting upwards, sideways, in the back, or simply extending the width of the Soundbar, the Virtually Invisible 300 do a great job at producing good quality audio. Their sound is clear, powerful and definite, perfectly complementing the SoundBar. The wireless transmission used between the SoundTouch 300 and the Virtually Invisible 300 is reliable. They can communicate to moderate distances and there is no transmission degradation of quality, no latency and no loss of signal. Movies sounded great and very well-defined without any lag or lip-sync issues. The speakers are lighter on the bass which is to be expected considering their size, but their lower-middle range is tight and punchy. They also have crisp and well-defined top end suitable for all kinds of media, such as music, films and video games. The small and compact design of the Virtually Invisible 300 can be reflected in the reliability, sound quality and looks. The speakers are very small, with a weight of only 600 grams and a height of 8 centimetres and a width of 9 centimetres. This compact and light design allows them to be placed almost anywhere, such as desks, shelves, cabinets and so on. However, they need to be close to a wall socket or another type of power supply as the need to be plugged in for a constant stream of power. The power cords with adapters are small, but add a slight amount of inconvenience to an otherwise ‘invisible’ product. These wireless surround sound speakers are easy to use and easy to set up. 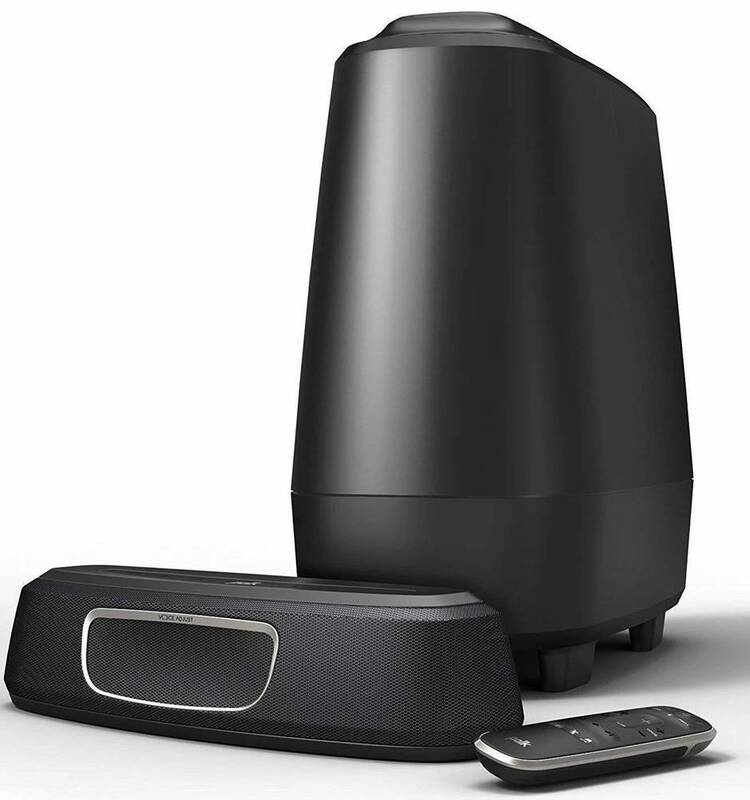 As they are created as add-ons to the Bose SoundTouch 300, they do not have any controls or set up requirements. 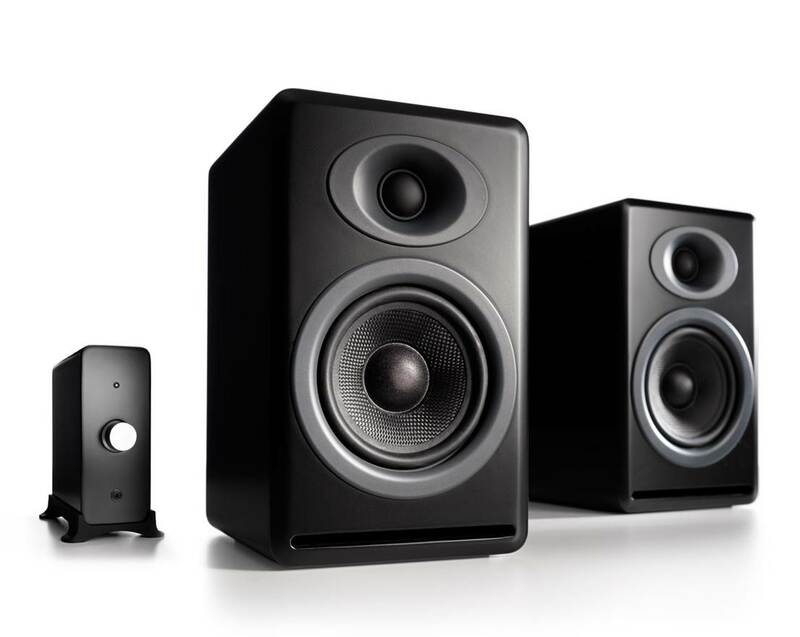 They automatically connect through wireless with the closest SoundTouch 300, duplicating the sound and extending the audio image depending on their placement. The Verdict? The Bose Virtually Invisible 300 are some of the best high-fidelity speakers that provide crystal clear audio performance and crisp sound effects. Their purpose is to place the listener at the centre of the action by duplicating the sound of the SoudTouch 300 and giving the users the freedom of placing the speakers wherever they desire. They can either create a very large soundstage or work towards making a truly immersive audio experience. These speakers are excellent for different types of media, whether its music, video games or films. The put the listener at the centre of the action and create a sense of envelopment. They are a great upgrade to an already reliable speaker system and are a great fit to anyone who is looking for a budget friendly surround sound system. They are adequate to be used in spaces which are uneven or have limited places for speaker placements for home theater setups. Overall, they are a reliable, high-performance and some of the best high-fidelity speakers with HD sound performance and has a stable wireless connection for home theater systems. The Edifier R1280Ts are some of the best high-fidelity speakers with incredible sound. These speakers are tailored to produce studio sound quality with natural sound reproduction from its 13mm silk dome tweeter and 4 inch full range unit. The 4-inch bass driver and a calibrated, flared bass reflex port allows this bookshelf speaker to deliver robust, rich bass notes that are full of presence and depth. It even comes with a remote control for you to adjust the volume at your finger tips, with bass and treble control located on the main side of the speaker. 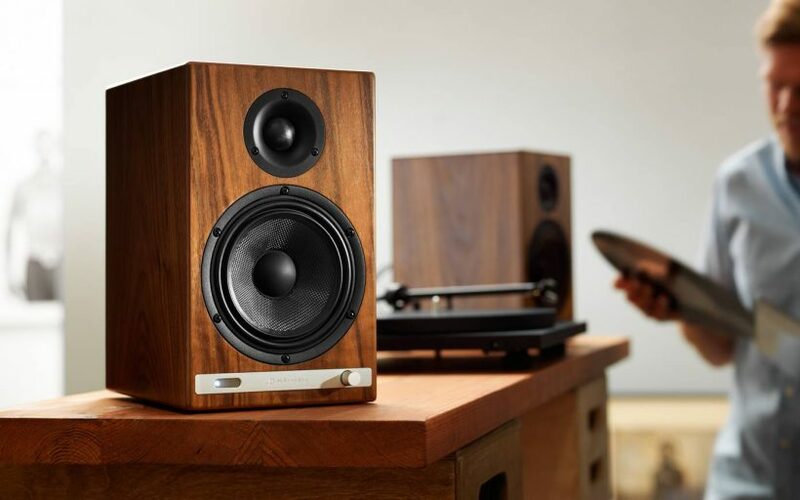 The R1280s are also available in classic wood finish with high quality MDF wood build finished with wood effect vinyl which makes these speakers look really sleek. At this price range, the Edifier R1280Ts are some of the best high-fidelity speakers available in the market today. Straight out of the box, the quality and finish of the R1280Ts was noticeable. They have the weight that all quality electronic speakers have when them. The packaging was done reasonably well and there were no issues to any of the items in the box. The R1280Ts (4” by 3”) are slightly larger than most bookshelf speakers which depending on the space of your room could be a plus or minus. We also liked the fact that the speaker has the controls on the side gives them an elegant and aesthetic feel to them. Input wise, this speaker supports connection to any device that has a 3.5mm headphone output or dual RCA output. You can even connect to two devices via AUX at the same time without any plugging or switching required. When hooked up to the home theatre / PC system, we were quite blown away at the sound quality, even at the lower volumes. The sound that these Edifiers reproduced was more lifelike than we had expected – it sounds natural and smooth with a level of detail that feels incredible. You can hear instruments and sounds that you did not hear before in various songs / instrumental music. The vocals and dialog do not get muddled by the bass or mids and stays where it should be – clean, detailed and perfect. The Edifiers do not distort even when the volume is turned up to maximum. In short, the sound coming from these 2.0 bookshelf speakers are great for what it is. The mids and treble are linear and clear, which really shines and brings out the detail in acoustic music. There is a good balance of mid-highs and we loved he fact that the treble and bass is adjustable. The bass has presence and depth but obviously these do not have the some capabilities of a dedicated subwoofer – so if you need a deeper low end a dedicated sub would be required. We would recommend combining the R1280Ts with a separate subwoofer to complete the sound. For better sound quality, we would also recommend replacing the included 3.5mm to RCA cable with a high quality Mediabridge one to improve the audio clarity. The Verdict? The Edifier R1280Ts are among the best high-fidelity speakers which deliver phenomenal sound performance. In addition, the wood finish and build quality of these speakers are superb. What 2 years of warranty included in the package at an affordable price range, these bookshelf speakers are hard to beat. Overall these speakers are very solid high-fidelity speakers and come highly recommended. The ELAC B6 Series 6.5” bookshelf speakers are some of the best high-fidelity speakers that give solid audiophile performance for a fraction of the price. It comes with custom made drivers, woven aramid-fiber woofers, an integrated custom waveguide system and an intricate crossover to produce the best quality sound. The sound performance of the B6s is hands down phenomenal – it produces natural, smooth sound with a detailed top end, uncoloured mids and extended lows with superb imaging and separation. These speakers use aramid fiber in the woofers which gives a superior strength-to-weight ratio and improved damping characteristics over conventional drivers, giving it a broader frequency range and smoother response. The B6s come with thick MDF outer walls with a textured vinyl finish to reduce sonic vibrations. It even features waveguide technology around the drivers to improve directivity control and shield the dome tweeter from cabinet diffractions. All in all, the B6s are some of the best high-fidelity speakers you can expect to find in its category. 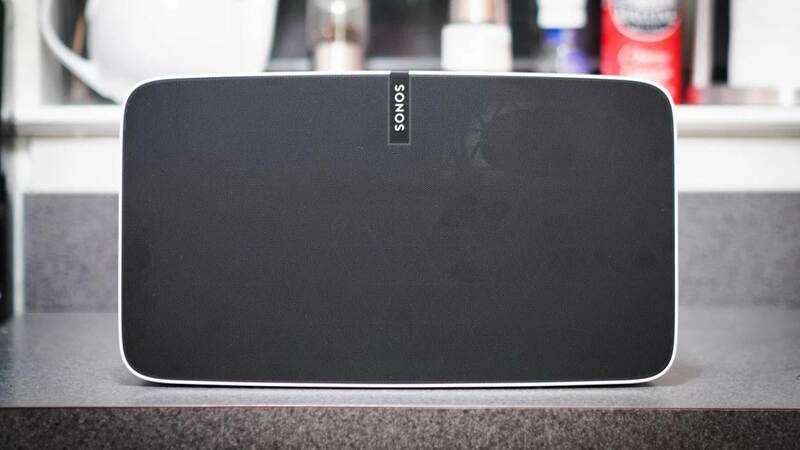 Our first impressions of the B6 were that these speakers were incredibly good for their price. These speakers pump out phenomenally good sound with every genre of music from instrumental to vocals to rock and pop. Given the right placement, these speakers sound absolutely stunning – the soundstage is exquisite, the bass is tight and controlled, and the mids are crisp and clear. The woven woofer is extremely nice aesthetically and we absolutely loved just sitting in front of these speakers and enjoying the music performance. We were also very impressed by the quality of the bass – on the B6s you get bass that is incredibly tight and musical, and will literally bring your old soundtracks to live. We tested these speakers with vinyl recordings and were highly impressed – the highs were detailed, very clear and life-like, without being sharp or granting. Musical performances were deeply felt together with an incredible soundstage which gave the music a certain depth of quality and beauty. The B6s was able to pull off the midrange well, making it sound sweet and smooth and much fuller than other bookshelf speakers. The B6s produced so much bass that we think you don’t really need a subwoofer to add to these speakers. Furthermore, the bass feels more satisfying and clean than a dedicated subwoofer, which is really amazing given the size of these bookshelf speakers. On top of the incredible sound performance, these speakers provide phenomenal imaging and the sound is extremely well put together – even at high volumes the B6s will not distort or deteriorate the sound quality. Our experience with the B6s was nothing short of stunning. The build quality of the B6s on the whole is clean and simplistic. The thick MDF outer walls give these bookshelf speakers a clean and modern finish while reducing sonic vibrations. The materials used are of very good quality and you can feel the weight in these solid speakers straight out of the box. Apart from placing these speakers on your bookshelf, you can also mount them as a pair of stand-mount speakers to serve as front channels for your home theatre system. These speakers will provide a very detailed, convincing and satisfying presentation at a budget price, and deliver an incredible and emotion music performance that redefine the way you hear music. The Verdict? 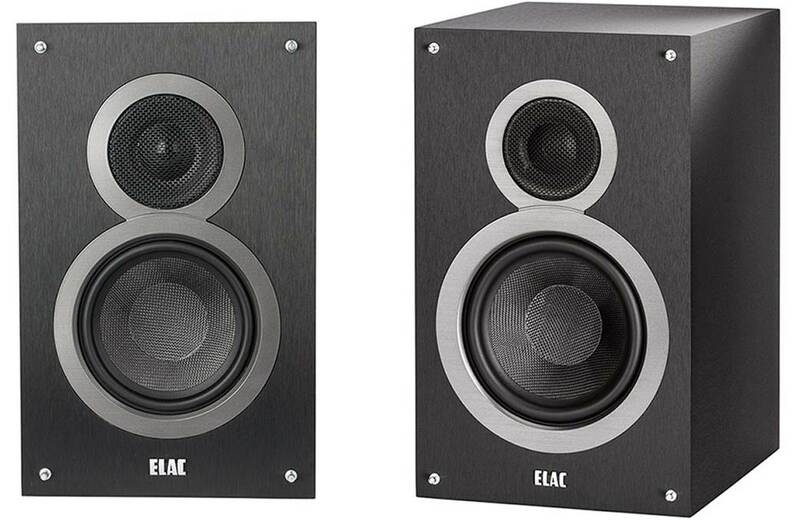 If you are an audiophile looking for some of the best high-fidelity speakers at a very good price point, the ELAC B6s are your answer. These speakers have the potential to redefine everything you knew about music and home theatre, and bring home a world of true, full listening. These speakers produce incredible depth and quality to the music with phenomenal imaging and soundstage. Given the right placement in your home theatre system, these speakers could well and truly be some of the best bookshelf speakers you have ever heard. In terms of acoustic performance, we would conclude that the B6s are without a doubt at the very top of the spectrum and are among the best high-fidelity speakers you can find. The Bose SoundLink Revolve is one of the best high-fidelity speakers that have deep, clear and immersive sound with a true 360 degree sound coverage. The unique design of the SoundLink Revolve speaker allows instruments and vocals to naturally separate and spread across an immersive soundstage. It is crafted with a sleek aluminium body which is durable and water resistant up to IPX4, and comes with an incredible battery life of up to 12 hours of continuous playtime. The SoundLink Revolve also supports wireless pairing with your mobile devices with voice prompts, and allows you to take calls or access Siri or Google Now from the speaker microphone. You can also pair two speakers together for extra sound and larger sound coverage. If you are looking for one of the best high-fidelity speakers for a fully immersive 360 sound experience, the Bose SoundLink Revolve would be an excellent choice. The Verdict? The SoundLink Revolve is one of the best high-fidelity speakers you can find which provides a truly immersive 360 degree sound experience with deep and impactful sound. Apart from the stylish and sleek aluminium finish, the speaker itself is designed to be extremely durable and water resistant, allow you to take it virtually anywhere on the go. The battery life is a stunning 12 hours of continuous playtime on a single charge, and the speaker can be paired with another SoundLink Revolve for twice the music output for larger spaces. It can also connect instantly to your mobile device via the Bose Connect App which also provides firmware updates to enhance the sound performance of the SoundLink Revolve. If you are looking for one of the best high-fidelity speakers to take around with you for parties or gatherings to stream music on the fly, the SoundLink Revolve is undoubtedly a great option to consider. The Aiwa Exos-9 is one of the best high-fidelity speakers for home theatre and provides massive sound performance. The Exos-9 can pump out a massive 200Ws of power with its 5 high performance acoustic drivers, and includes a 6.5” dual-voice coil subwoofer which delivers incredible stereo sound. You can optimize the sound performance by adjusting the bass, mids or highs with the 5-band graphic equalizer or use one of the pre-set EQ settings that suits your sound preference. Apart from the intricate customization options, the Exos-9 is capable of producing distortion free sound with the deepest bass that you will hear from a set of wireless speakers. It also features the latest wireless connectivity technology with aptX and A2DP support and android NFC streaming, and also supports a 3.5mm audio jack for direct connection with non-wireless sources. The battery on the Exos-9 is a massive 57.2Wh lithium ion rechargeable battery which provides an incredible 9 hours of continuous music playback. At the time of writing, the Exos-9 is hands down one of the best high-fidelity speakers you can find that delivers massive home-theatre-like sound performance at a fraction of the price. The sound of the Exos-9 is exceptionally good and hard to believe. These speakers are designed to literally rock a party with a massive 200W of pure audio authority. The bass is rich, powerful and clear, and never muddy. The midrange is present and crisp, and the highs are not overbearing. At maximum volume, the Exos-9 can literally shake your house and the sound does not distort even in the slightest, which is truly impressive for a battery powered speaker. The music separation on this speaker is fantastic and you can really hear the instruments and subtle notes in the music. The bass output is quite insane – the bass is tight and punchy and stays where it should be at the low-end without bleeding over into the midrange. Listening to rock and pop songs on the Exos-9 was one of the most enjoyable experiences we had in audio listening. One of the reasons why the Exos-9 sounds so good is because of its 6 internal acoustic drivers that maintain a sense of balance between the highs and the midrange, keeping them present and detailed. The 6.5” inch dual-coil subwoofer also enhances the bass response and creates a sonic low-end that makes your music literally jump out of the speaker. The end result is phenomenal sound performance that makes the Exos-9 suitable for home-theatre setups to provide cinematic sound. We were truly impressed with the sound performance of this wireless speaker. While the Exos-9 is slightly larger than most wireless speakers, it weighs a mere 13 pounds which makes it quite portable to carry around. The great thing about the Exos-9 is that you are able to link up two Exos-9s easily to provide either stereo separated (left and right) or dual stereo sound for extra sound performance. This makes it easy to setup for larger parties and gatherings with a larger dual sound performance. You can also customize the EQ settings for almost every genre of music and adjust the bass, midrange of treble settings. The drivers on this speaker do not distort at maximum volume and produces clean and crisp stereo sound. As mentioned above, the battery life on the Exos-9 is an incredible 9 to 10 hours of continuous playtime which makes it perfect for disco parties or large gatherings. The Verdict? The Aiwa Exos-9 is one of the best high-fidelity speakers you can find in terms of value and incredible sound performance. The manufacturers have so much trust that you will like this speaker that they have included a 1 year warranty on these speakers and a 60 day satisfaction guarantee. Not only were we so impressed with the sound performance, impactful bass and crisp highs on this speaker, you also have the added option of adjusting the EQ settings and pairing the Exos-9 with another Exos-9 for dual sound performance. It also comes with the latest wireless music streaming technology for high quality audio streaming. With its massive 200W of pure power and subwoofer, it is no surprise that the Exos-9 is really one of the best high-fidelity speakers you can get at an affordable price with thunderous sound performance. The Libratone ZIPP is some of the best high-fidelity speakers that feature a full 360 degree sound and up to a whopping 100 watts of pure power. The sound performance of the ZIP is pretty remarkable, with the its acoustic drivers able to produce deep bass, full midrange, and crisp highs from multiple wireless music sources. The battery life of the ZIPP can produce an incredible 10 hours of continuous playtime on a single charge, and is easily portable with its convenient carrying handle. 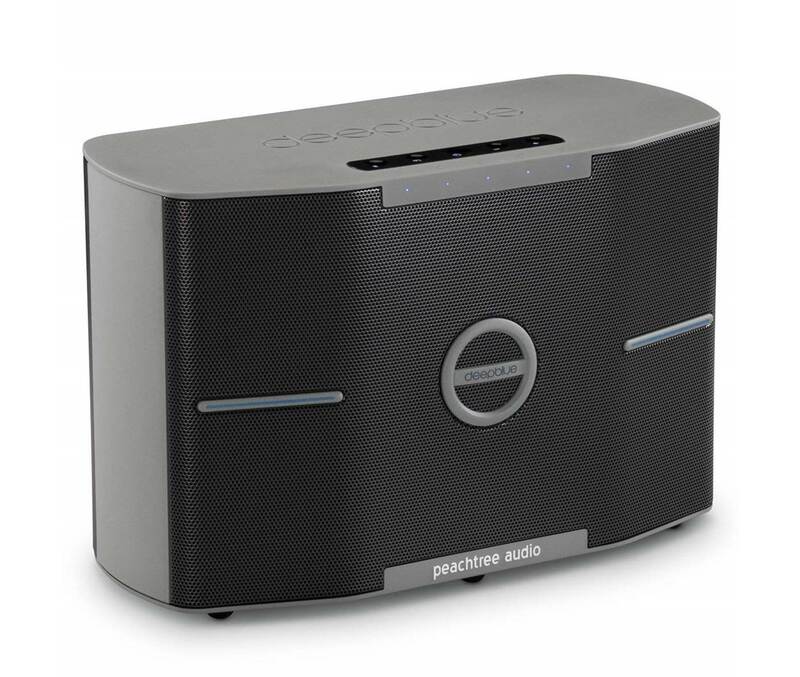 The speaker is capable of streaming music from a variety of wireless sources including Wi-Fi, AirPlay, Bluetooth and Spotify Connect. It also comes with a nice Libratone app which allows you to pair up to 6 ZIPPs together to create an immersive and wide listening experience in multiple rooms. The ZIPP has a very unique circular design and shape which helps to distribute the sound in a 360 degree fashion, which means that you can place the speaker virtually anywhere and it can fill a room with music easily. The ZIPP is easily one of the best high-fidelity speakers if you are looking to stream music over a variety of music sources with an incredible 100Ws of power. The Verdict? You simply cannot go wrong with the Liberatone ZIPP with its stunning 100Ws of power and 360 degree sound dispersion. Its hands down one of the best high-fidelity speakers that you can find if you need plenty of sound to fill up a large room for a disco party or a large gathering. We also liked the fact that you can pair up to 6 of these speakers together to create a larger soundstage and field of dispersion over multiple rooms. The sound quality on the ZIPP speakers is also excellent, with crisp highs, detailed mids and a punchy low-end that does not sound muddy. The app that comes with this speaker is also very intuitive and convenient to use, and can be used to easily pair the speaker with a variety of wireless music sources including Wifi or Airplay. Although slightly on the more expensive range, the ZIPP is one of the best high-fidelity speakers you can find that will truly deliver a superior sound experience that you will enjoy. The Marshall Woburn is one of the best high-fidelity speakers that combine the classic rock era aesthetics with modern wireless connectivity. This single speaker is built with two 20-Watt Class D amplifiers for tweeters and a 50-Watt Class D subwoofer that delivers dynamic highs, mids and lows of your favourite music. It is also capable of delivering a 90-Watt output that fills room with booming sound that feels rich and refined. You can hook this speaker up analogue with either an RCA or Optical, or you can connect wirelessly through Bluetooth. We also liked the classical and vintage design of the Marshall Woburn which gives it a unique aesthetic appearance. Overall, the Marshall Woburn is one of the best high-fidelity speakers that pump out clean stereo sound with a refined vintage appearance. The Marshall Woburn lives up to the power and quality that the Marshall Woburn brand is known for. The quality of sound is made by a combination of the two 20-Watt Class D amplifiers for tweeters and a 50-Watt Class D subwoofer. These elements translate low, undistorted bass, clean high trebles and an amazing mid-range at all volumes. Every detail of your favourite music can be experienced with the detailed clarity and precision. This speaker has a maximum sound pressure level of dB at 1m. Though this a smaller Bluetooth version of the 70’s classic amplifier, it produces sound the same crystal-clear sound for the casual listener and ample power for musicians. We liked the fact that you can crank up the volume on the Marshall Woburn to maximum without hearing any distortion. The stereo separation on this speaker is clear and refined, and provides relatively good soundstage for a Bluetooth speaker. The Marshall Woburn Bluetooth Speaker is designed to be a versatile loudspeaker with a beautiful retro-aesthetic. Built in the image of the classic Marshall amplifiers this speaker features a vinyl encasement, vintage looking front fret cloth, gold-coloured metal details, and the iconic Marshall logo across the grill. The speaker is designed to work with a variety of sources such as RCA, Optical, Bluetooth and 3.5mm input allowing you to connect your phone, tablet, computer, TV, CD player, turntable, streaming play, Apple TV, Airport Express, or Sonos unit. This Marshall speaker is simply a beautiful little miniature of its classic stadium filling predecessors. The Verdict? The Marshall Woburn is one of the best high-fidelity speakers that both music lovers and musicians will enjoy. This speaker uses that 70’s retro aesthetic and combines it with wide spectrum of connection options so you can listen to your music in style. It takes the power and presence of the Marshall Woburn brand and delivers a boisterous musical experience. The sense of clarity from the highs to the lows can be heard as this speaker pushes out loud, crystal clear sound any room you put it in. The level of stereo separation on this speaker is very good and you can easily distinguish the notes coming from the left and right channels. On the whole, the Marshall Woburn Bluetooth Speaker is one of the best high-fidelity speakers for music lovers looking for a retro-style speaker and we highly recommend them. The Peachtree Audio DeepBlue3 Bluetooth stereo speaker system is a powerful and well-rounded speaker for any room in the house. Designed with a 6.5-inch subwoofer, two 3-inch midrange drivers and two 1-inch tweeters this 3-way speaker system delivers crystal-clear sound in any room it occupies. It is also highly versatile allowing you to connect 5 Bluetooth wireless devices or through a selection of analogue sources. This speaker is equipped with a 440-Watt amplifier that delivers everything from classical strings to dynamic depth of bass from on-screen explosions. It can provide enough volume to fill up a large room with rich and filling sound quality with good stereo separation. On the whole, the Peachtree Audio DeepBlue3 is one of the best high-fidelity speakers designed to provide crystal clear sound performance and we highly recommend them. The Peachtree Audio DeepBlue3 has incredible sound and power for a wireless Bluetooth speaker. It combines a 6.5-inch woofer, two 3-inch midrange drivers and two 1inch tweeters to produce crystal clear highs without distorting at the low notes. This dynamic range of sound combined with the 440-Watts of power allows this speaker to blast any genre of music without having to constantly adjust it. The speaker provides full-range sound performance and covers practically the entire sound spectrum with great attention to detail. It can become easy to lose yourself in the sound as everything from the tinniest pin drop to amplified bass can be heard from any corner of the room you place it in. The bass output from this speaker is also quite good and adds deep punchy tones to the music. It’s a speaker that delivers a good deal of volume and quality stereo sound and is suitable for a wide variety of music genres and listening tastes. The Peachtree Audio 3-way Bluetooth stereo speaker is extremely versatile and mobile despite its high power output. The Bluetooth is capable of being connected to five separate devices with extended range of 75 feet which is really convenient. It is also designed to hook up with a 3.5mm AUX cable and optical, making it possible to use this device as a centrepiece for a TV or a full home audio system. This all-in-one system can be controlled with a remote included for your convenience. It can be used as a central front-channel speaker for home theater or a standalone speaker for casual music listening – we thoroughly enjoyed the sound quality of the Peachtree Audio speaker and the sound clarity that it delivers. The Verdict? The Peachtree Audio DeepBlue3 Bluetooth stereo speaker system is one of the best high-fidelity speakers that can neatly fit into a variety of lifestyles. With 440Watts of power and the massive 6.5” subwoofer, this speaker system can fill up a large room with high fidelity sound performance. The level of stereo separation that you get from the dual drivers is very good, and music performances sound lifelike and very refined. Apart from the good sound quality, the Peachtree speaker features a multitude of connection options allowing it to be the centrepiece speaker for home audio. Overall, the Peachtree Audio DeepBlue3 is one of the best high-fidelity speakers which deliver crisp sound quality and good stereo separation, and we highly recommend them to enhance your home audio experience. The Polk Audio T15 are some of the best high-fidelity speakers that provides crystal clear music performance with Polk Audio’s exclusive Dynamic Balance Drivers and tweeters for wide response and low distortion. It features rubber driver surrounds that improves frequency response and improves durability. It also comes with magnetically shielded enclosures to eliminate any static distortion which you might get from exposure to nearby audio wires. We liked the fact that the T15 stereo speakers are sonically-matched speakers designed to work together in synergy to deliver a fully integrated stereo performance with good separation and detail. The speakers come with dynamic balance silk/polymer composite tweeter with neodymium magnets delivering a lush, balanced soundscape. Furthermore, the speakers are relatively easy to setup and supports Dolby and DTS, allow them to form part for your home theater listening experience. Overall, the Polk Audio T15s are some of the best high-fidelity speakers you can use for home audio installations and we highly recommend them. The Verdict? The Polk Audio T15 is one of the best high-fidelity speakers designed to integrate into a surround sound system and works great as bookshelf speakers. The speaker is capable of deliver crisp highs, detailed midranges and tonal bass which make them enjoyable to listen to especially for instrumental and vocal performances. The speakers has a sensitivity of 89dB with a 5-1/4” dynamic balance polymer composite woofer with rubber surround and ¾” dynamic balance silk polymer tweeter. It supports Dolby and DTS, and can form part of your home theater system as frontal or dialogue speakers. The sound quality on the T15 is very clear and well-defined, with nice separation and soundstage that really immerses you into the music. That being said, our only quibble with the Polk audio T15 is that it lacks bass response – this can be easily supplemented with a dedicated subwoofer for a deeper low-end. 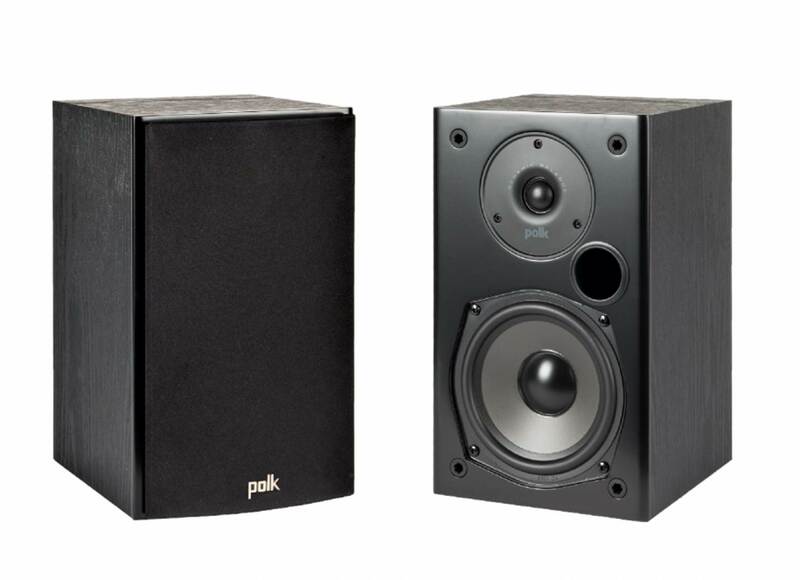 The Polk Audio T15s have a very durable and sleek MDF cabinet design that blends in nicely into modern home décor. Overall, they are some of the best high-fidelity speakers that provide really good sound quality and performance, and we highly recommend them. The JBL Arena B15 is one of the best high-fidelity speakers with superb sound quality. It comes with a powerful 1 inch (25mm) soft dome tweeter which provides clean and crisp highs, together with a 5.5” (140mm) polycellulose woofer with room-filling sound performance. 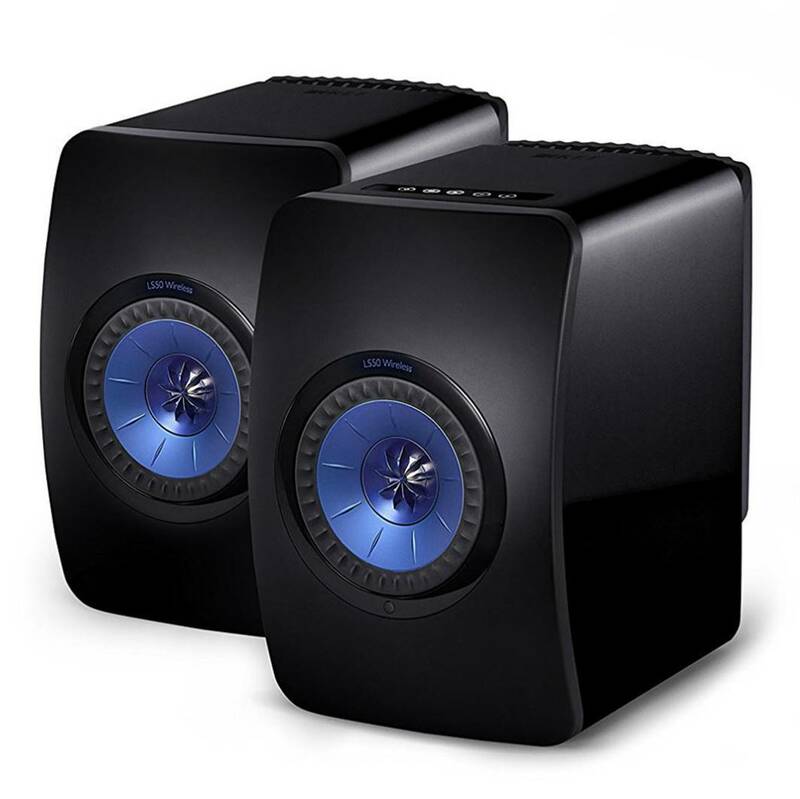 These speakers are capable of producing a tonne of volume output and fill up the entire room with rich and clear music for TVs and gaming. It comes ready with integrated wall-mount solutions for flexible installation and system configuration, and also works as a bookshelf or surround speaker in stereo or multi-channel systems. We liked the fact that the JBL Arena B15 has a wide frequency ranging from 100Hz to 40kHz, and a sensitivity of 86dB. It also features a contemporary all black cabinet shape and all black grilles which provide a sophisticated, modern look. 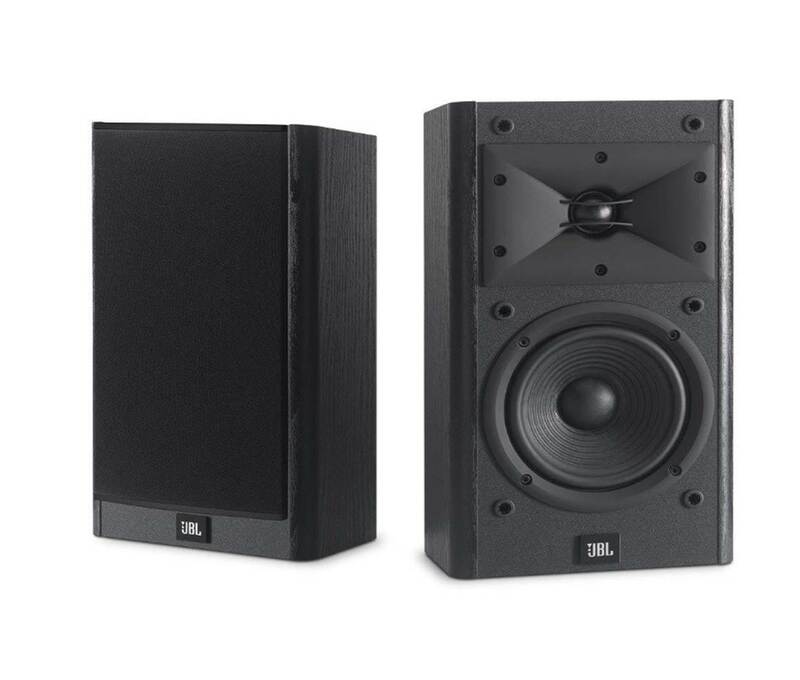 On the whole, the JBL Arena B15 is one of the best high-fidelity speakers that offer a great combination of sound quality and design with integrated wall-mounts. The Verdict? The JBL Arena B15 are some of the best high-fidelity speakers with crystal clear vocal reproduction and good soundstage. The tweeters deliver clean powerful highs with great attention to detail. While the midrange sound on the B15s is enhanced by the 5.5” woofers, these speakers have a shallow cabinet which reduces the overall bass reproduction and would definitely benefit from the addition of a dedicated subwoofer. We liked the fact that the JBL Arena B15 have integrated wall mounts which make them easy to mount on the wall and fit into an integrated home theater system. We liked the fact that the B15 speakers are housed in durable MDF cabinets and have a sleek and modern looking design. It also weighs around 17lbs per piece which is not too heavy to be placed on bookshelves. On the whole, the JBL Arena B15 is one of the best high-fidelity speakers that deliver crystal clear sound performance and clarity, and we highly recommend them. The Dayton Audio B652 are some of the best high-fidelity speakers that deliver authentic sound in a small package. They are essentially 6-½-Inch 2-way bookshelf speakers that can deliver crystal clear audio performance and plenty of volume for its size. The B652 are quality speakers that feature a black ebony pica vinyl cabinet finish with removable grilles. These small and compact speakers are capable of delivering excellent clarity and detail, and have a wide frequency range from 70 to 20,000Hz. The design includes quick connect speaker terminals and a key-hole hanger with two 9-1/2Foot long 20 AWG Speaker cables for easy installation. They work great as standalone speakers for a home audio system and can also be used as front or rear speakers for surround sound setups. Overall, the Dayton Audio B652s are some of the best high-fidelity speakers that are compact and portable with crystal clear sound performance. The Verdict? The Dayton Audio B652 are some of the best high-fidelity speakers you can find that delivers powerful and crisp sound performance in a small package. The speakers are very well-designed and have a black ebony pica vinyl cabinet finish which blends in nicely into modern home interiors. It also delivers good sound quality with nice treble ranges, clean midrange tones and a surprising amount of bass. Music genres such as country folk and orchestra performances sounded very detailed and clear with spaciousness and soundstage. It also has a removable grill which exposes the speaker drivers depending on your preferences. The speakers can also produce enough volume to fill up a large room with rich and filling sound with good clarity and with minimal distortion. If you are looking for one of the best high-fidelity speakers that are easy to setup and are fuss-free, the Dayton Audio B652 comes highly recommended. The Polk Audio MagniFi is one the best high-fidelity speakers that doubles as a mini home theater setup. The entire setup consists of a home theater sound bar system with a subwoofer that delivers room-filling audio and surround sound performance that you can expect from a home theater sound bar. It comes with Polk Audio’s voice adjust technology which increases vocal clarity and volume level for crystal clear dialogues. It also features Dolby Digital 5.1 decoding which creates really good room-filling audio performance with full-range sound quality. 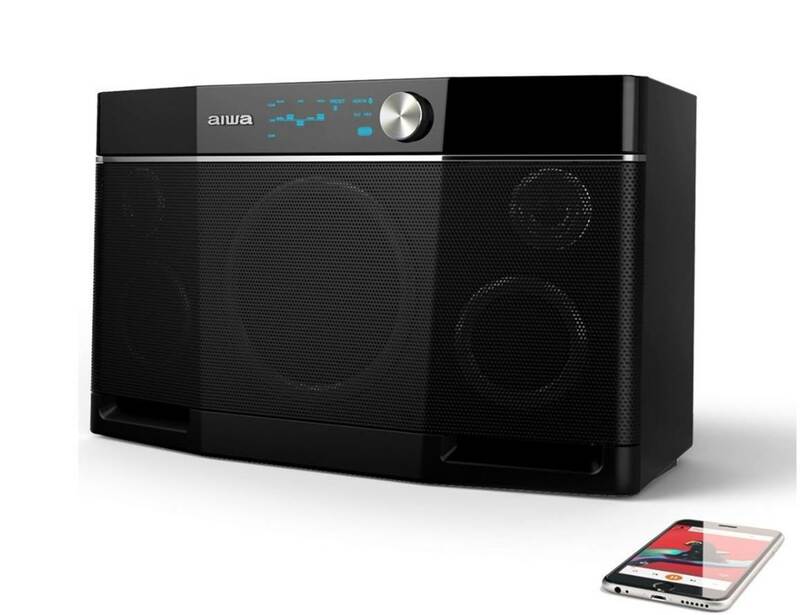 The speaker features wireless Bluetooth connectivity and can stream music directly from your mobile device; it is also compatible with all TVs. The speaker comes with a wireless subwoofer which delivers deep impactful bass for music and movies. The wireless music streaming works with any TV, cable box or satellite IR remote control – it also has optimized movie, music and sport EQ modes which you can use to adjust the sound quality according to your preferences. The MagniFi speakers are designed to be ultra-compact and blend in nicely with home interior décor. If you are looking for one of the best high-fidelity speakers that can mimic a full home theater setup, the MagniFi speakers are the ones to get. We were very surprised at how good the sound from the MagniFi sound bar and subwoofer sounded straight out of the box. We were initially sceptical that such a compact soundbar could produce surround sound – but we were proven wrong by these speakers. The soundbar provides really good room-filling surround sound and listening to the speaker feels as though you are listening to a multi-channel speaker. The level of detail in the music separation and soundstage is incredible – you get full immersive sound quality with a level of detail and vocal clarity that you would expect from a full-blown home theater system. The downward-firing subwoofer produces very deep bass that really resonates through the entire room – music and movies sound especially good with the subwoofer and have plenty of depth. The highs and treble ranges are neatly reproduced without any harshness; the timbre ranges feel smooth and pretty well-defined. The midranges are crisp and detailed, while the lower-midrange is really accentuated by the dedicated subwoofer. When we connected the MagniFi speakers to the TV, we were surprised at how good the speakers sound – they really do sound like home theater system speakers and produce surround sound which gives the impression that the sound is coming from different angles. In terms of sound quality, it’s definitely hard to go wrong with the MagniFi speakers. The MagniFi speakers come with wireless Bluetooth connectivity which works like a charm – you can easily stream music from your smartphone device to these speakers and the sound quality is really good. The sound is well-balanced and rarely requires any tweaks; it also has different EQ options to choose from to adjust the sound performance according to your individual preferences. The single sound bar that comes with this system has a six driver array that projects sound in different directions and creates an immersive soundstage. It also has a wireless subwoofer which connects to the subwoofer to deliver deep bass output. The speakers are relatively compact and fit easily into tight spaces while delivering room-filling audio. The system is equipped with Polk’s exclusive Voice Adjsut technology which increases vocal clarity – you can practically crank up the volume on the MagniFi and get very little to virtually no distortion. The universal sound bar works with the TV, cable box or satellite IR remote control and can be setup easily with a HDMI ARC cable. We also liked the fact that the speakers come with a night mode which allows you to listen to music soundtracks without disturbing the neighbors or family members. The MangiFi supports wireless streaming via WiFi, Google Home with Chromecast Audio and wireless Bluetooth streaming. The Verdict? The Polk Audio MagniFi is one of the best high-fidelity speakers that deliver home theater surround sound performance. It comes with a wireless soundbar and wireless subwoofer that delivers room-filling audio performance and immersive sound. The soundbar itself comes with six driver arrays that help to create a virtual soundstage and project sound effectively. The wireless subwoofer punches very deep and hits hard – the amount of bass that we heard from these speakers is staggeringly powerful. The soundbar also provides really good separation and makes you feel as though you are listening to a full 5.1 sound setup. The wireless Bluetooth connectivity works like a charm and we were able to stream music directly from our smartphone device to the MagniFi speakers without any issues. Furthermore, the MangiFi system can be easily connected to your TV or home console via HDMI cables or through the Wi-Fi network. The speakers feature Dolby Digital 5.1 decoding codec which enhances the overall sound quality and vocal clarity. If you are looking for one of the best high-fidelity speakers that can produce really good home-theater surround sound, the Polk Audio MagniFi speakers are the ones to get.